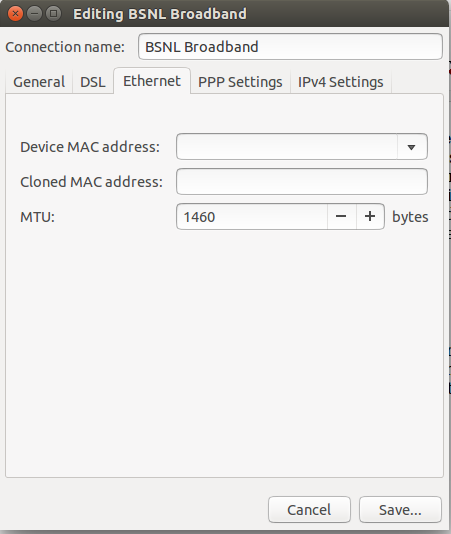 How I fixed my BSNL Broadband on Ubuntu - right MTU value, right DNS Servers! At my home town we have a BSNL Broadband connection powering a dual boot PC. As someone who likes to be on Ubuntu all the time, several websites (Yahoo, Wordpress.com blogs etc.) opening up slowly or not opening at all was a major problem for me. Surprisingly the same sites used work fine on Windows with same Internet connection. While I always knew that MTU (Maximum Transmission Unit) was the culprit, I never got an opportunity to fix it. This time I decided to fix it as we had recently migrated to a 512 Kbps connection and this is incomparable to my Beam Fiber connection at Hyderabad, all thanks to end of a golden era! The MTU value turned out to be 1460. When the bandwidth is limited one must optimize everything! I normally use ISP DNS and it works reasonably well. This time I could see slower speeds and therefore I decided to switch to Google DNS. Above two measures have made the 512 Kbps connection very usable on Ubuntu. So if you are stuck with poor internet browsing experience like me on BSNL Broadband and Ubuntu try this out.